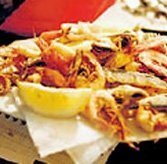 Interesting mix of Ligurian and Sardinian dishes in this family-run trattoria around since the 1950s (Genoa has plenty of Sardinian “exiles”). Vegetarian dishes such as torte di verdura pop up. Or go for the polpo alla catalana, in a sweet-and-sour pepper sauce. The thin pane carasau has the same effect as pistachios or Indian papadum — you keep eating it. Inexpensive and serious cooking that tastes great.